Thanks, exactly the setting I was looking for. Actually, Update does work if the key is not there. According to the MMC 3.0 help: "If the registry value or key does not exist, then the Update action creates a new registry value or key." Plus, I have verified that statement. You rock. A lot of garbage on the net on this topic , wasting time discussing managing this setting via admin template based GPOs. 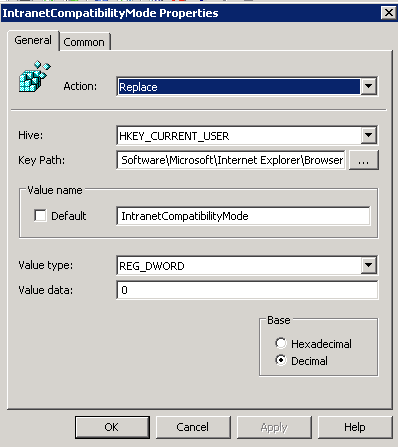 When either option via admin template locks into either an on or off state permanently. Which users then can't change on the fly as needed, or to test a misbehaving site then report its needed inclusion in the GPO managed compat mode site list. Props to you for finding the most flexible, and therefore in my view, correct GPP approach. Absolutely fantastic. Exactly what I needed but struggled to find. Awesome. Thanks, agreed with above. Sometimes surgical registry keys are preferred over the wide swaths of policy.